Seventeen kindly sent me two of their Mega Matte Lipsticks and the one which stood out to me the most was this gorgeous purple shade, called "Violet Summer". I absolutely love this colour as it's not just a gorgeous bright purple, but it's slightly metallic with blue shimmers running through it, absolutely gorgeous! Honestly, I wouldn't have usually picked up a lipstick in this shade as it's very out of my comfort zone, but like they say, your life doesn't start until the end of your comfort zone and I am taking the chance to make this lipstick work as I love it so much! Not only is this lipstick a gorgeous colour, but it's also extremely soft and creamy even though it's mega matte which is everything you need when wearing a matte lipstick as it's not even close to being drying! Unfortunately, some matte lipsticks can be so so drying that you just can't wear them, but this isn't the case with this lipstick from Seventeen. As well as this, this shade is extremely pigmented, and I mean a ridiculous amount of pigment unlike other lipsticks which are on the market which you need to layer and layer until you have a high quality amount of colour on your lips. For only £4.49 from Boots, these Lipsticks are definitely worth the small amount of month! They're inexpensive, high quality and long lasting too! I'd definitely purchase them all. They also kindly sent me the Mega Matte Lipstick in the shade "Roses are Red" the perfect bright red for Christmas! This lipstick is also extremely pigmented and very creamy! I found this also isn't drying on the lips even if you do not use lip balm which is perfect! I never have a lip balm near me when applying lipstick so I'm glad this has such a creamy consistency as well as being very matte! This lipstick is also £4.49, and for such a highly pigmented bright red, I recommend it to everyone around this time of the year and the next few months when it gets a little bit colder and more christmasy! My boyfriend loves this shade on me which is a real winner! It's not too dark for my pale skin. Seventeen also kindly sent me the Instant Glow Tan Cream Bronzer which is only available in one shade. After receiving a cream contour palette from Covershoot Cosmetics, I instantly fell in love with cream products and I was so pleased when I received this and couldn't wait to try it out! It's now part of my every day makeup routine, now it's the colder months and the sun is very rarely shining, my skin needs the tan! However, I am not a fake tan user, so this is the next best thing! "This lightweight cream bronzer contours cheekbones and décolletage for definition and colour. Build to YOUR perfect glow." This is the most creamiest cream product I have ever used (I've only used two brands), but you know what I mean! It's amazing. It's so so easy to blend, it's not too orange on my skin and it's build-able too! I haven't tried using this as a contour yet for my cheekbones, however I use it to add some colour to my face and it does the job in such a natural way. For only £4.99 for a creamy, pigmented natural bronze, it's worth the money! Plus they currently have a deal on in boots for two selected items for £8 which is a bargain! Last but not least, Seventeen also sent me the Long Lash Mascara. This is definitely a lengthening Mascara and by far it is my favourite of all the Mascara's I have ever tried. I only use one coat of this mascara and it leaves me with fluttery, long, and as you may say "flirty" lashes which are jet black too. The mascara lasts all day and I have not been left with any excess over my eyelids either. I have been able to remove this mascara with baby wipes, micellar water and Soap and Glory makeup remover without fail and it has always come off in one go. "Seventeen Long Lash mascara has a special mini brush which captures even the tiniest lashes, lengthening and building full intense bold lashes that last all day. No need to reapply as this mascara does not flake or smudge. #noflakes #nosmudges"
Overall, I am in love with this product, it does it's job by providing me with long lashes which look false even though they're not! Since using this product I have been given many compliments on the way my eyelashes look and it's down to this Mascara! For only £6.99, I'm genuinely shocked at how amazing this product is, compared to many mascaras which I have paid over £13 for which do not always give me the long lashes which I really want. You can also pick this up in the deal on Boots for two selected products for £8. So, to buy this and the bronzer, you're saving yourself £4 which is a bargain for high quality products which are so inexpensive! I highly recommend trying this mascara out if you're on the search for a new one. I'd like to thank the girls from Seventeen for giving me the opportunity to test and review these products. 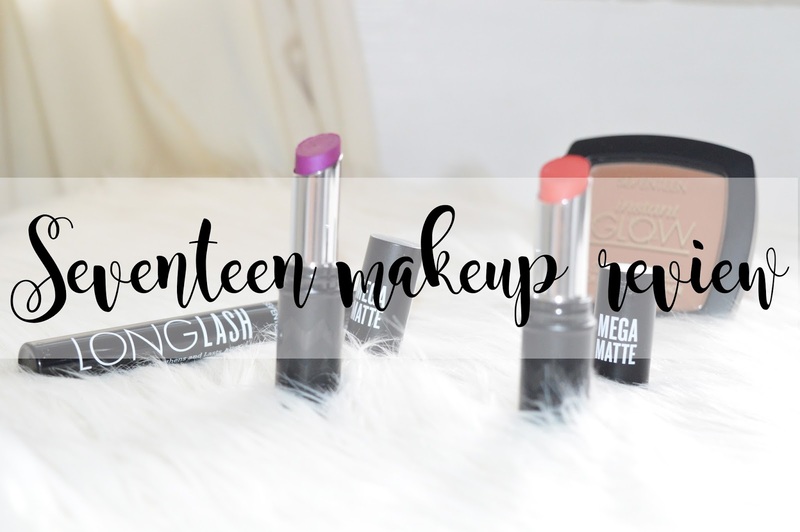 Have you tried Seventeen products? Let me know what you think of them and if you recommend any too me!